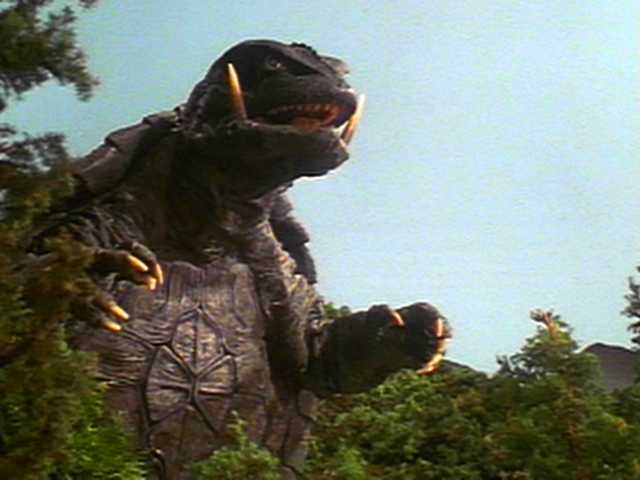 Gamera: Guardian of the Universe (1995) – SKREEONK! The Guardian of the Universe makes his Triumphant, Trumpeting Return! ガメラ 大怪獣空中決戦 Gamera: Daikaijū Kuchu Kessen – Gamera: Giant Monster Midair Battle! In 1995, a tanker carrying a load of Plutonium runs aground on a mysterious atoll. To the crew’s horror, the atoll drifts away mysteriously, leaving them baffled. The next day, an urgent phone call comes in at a Zoo from an island under investigation, but was cut short due to unknown circumstances. The island was being explored by the Zoo due to reports of a giant bird being spotted. At the request of the police, an ornithologist heads to the island after communications were cut off. Upon arrival, they find the local village destroyed, and no survivors were found. All that was found was a pile of undigested materials left by an animal, with some of the ornithologist’s colleague’s possessions inside. Suddenly, the giant bird appears. Giving chase, they try to take pictures, and the creature retreats, along with two others of its species. Meanwhile, the floating atoll is found, with a large metal plate stuck in the rocks. Suddenly, the plate shatters, and it begins to move again, straight for Japan. A plan is hatched to capture the three young birds inside a baseball stadium with a closeable roof. The plan is going accordingly, but a mishap allows one of the birds to escape. Helicopters follow it, trying to track its movements when the ocean explodes and Gamera stands up, rocks rolling off his back. Gamera swats the escaped Gyaos out of the sky and makes his way toward the stadium. As he arrives, the other two Gyaos break out and fly away. Gamera chases after them, and soon is shot out of the sky and bombed at the foot of Mt. Fuji. 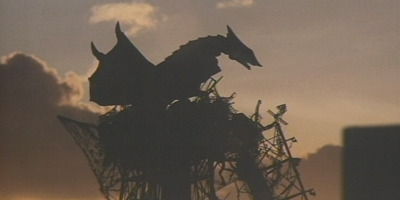 The final remaining Gyaos attacks, but Gamera escapes to the sea to heal himself. The small band of scientists who discovered the Gyaos and Gamera figure out Gamera is the good guy, and they try to persuade the military. Finally, the authorities figure out that the scientists are right, and attack Gyaos. Unable to stop the monster, Gamera shows up once again and finally defeats him for good…or does he? In 1984, Godzilla was resurrected to begin his destruction once again. This new series progressed into the mid-nineties, and brought along some enjoyable moments. The success of Godzilla in the nineties must have sparked renewed interest in the giant monster genre; enough interest to bring back Gamera. 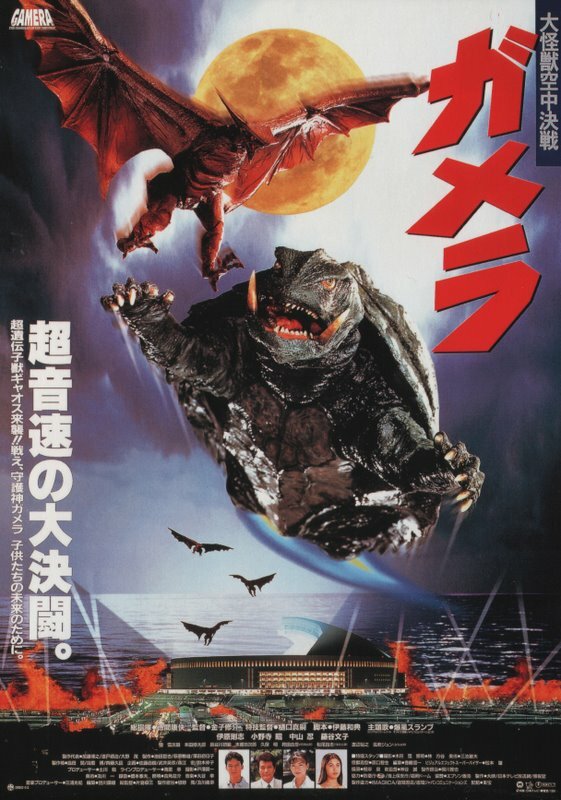 “Gamera: Guardian of the Universe” is the first in a three-movie series that spanned from 1995 to 1999. The story: Gamera: Guardian of the Universe had a very interesting origin story. Gamera is no longer just a giant turtle, but the product of genetic engineering. One thing that shared similarity between this release and the original was the plate, which had Gamera’s story written on it. In the 1965 film, there was a small stone which bore ancient Inuit carvings telling Gamera’s story. So alike, yet still so different. The story is very well thought out. Gamera was created by an ancient yet highly advanced civilization by means of genetics. The plate is further translated to reveal that he was created to kill the Gyaos; another creature created by genetics, only one that went awry. Gyaos, instead of just a giant dinosaur, is a genetically engineered being. The story that is proposed concerning their appearance is another well-thought out story. The monsters had been in hibernation due to food shortage. In short, they had picked off all of the ancient civilization, and with no resources to sustain them they disappeared. Their reappearance was due to the fact that humans have polluted the earth to the point that the conditions were right for their reemergence. The military’s misguided judgment in terms of dealing with the monsters is interesting and keeps the viewer on the edge of their seats. When Gamera appears, he causes much destruction, and the military considers him more of a threat compared to the small Gyaos birds, which leads them to focus their attack on Gamera. Only when Gyaos reaches immense size and starts to invade the city does the military realize their mistake and change their plans accordingly. The cast: The characters in this movie are very enjoyable, and the viewer enjoys following each one. Each character has a story, and even the secondary characters are superb in what they’re given to work with. The film starts out with Yonemori, who feels responsible for the accident of the plutonium ship, even though no leakage was discovered. He desperately wishes to become part of the expedition, and finally he is given permission. Naoya Kusanagi allows him to help with the investigation, and the two actor’s performances compliment each other well. Naoya Kusanagi also plays the father of Asagi, arguably the most pivotal actress in the movie. Kusanagi doesn’t really understand his daughter, and when her connection with Gamera is revealed to him, he meets it with skepticism. This was the debut film appearance for the actress playing Asagi (whom I just discovered recently was the daughter of actor Steven Seagal! ), and despite being a little flat, her role is very important, and she pulls it off well. I say flat because at times it looked as if she were trying too hard to portray certain emotions, but it was her first film, and she did a splendid job. Dr. Nagamine, the ornithologist, quite possibly gives the best performance of the entire cast. She is presented with the daunting task of capturing the Gyaos, and her vocal displeasure gives the viewer a sense of power and wit in her character. The last character worth mentioning is inspector Osako. His fright and whiny attitude is portrayed perfectly, but his idea for the capture of the Gyaos elevated his character from being just whiny to a level of importance. As I said, nearly all of the main characters in the movie had a purpose, and all gave astounding performances. The monsters: Shusuke Kaneko’s team did an absolutely superb job with the designs of the monsters. 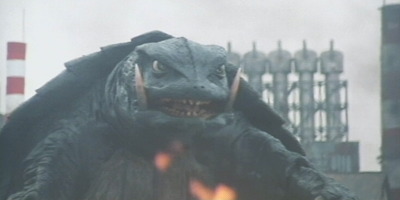 Gamera’s design put his head a little flatter and wider. The head movements were very organic, giving it a strikingly life-like appearance. His shell was a vast improvement over the original. The chest of the original Gamera had just a crosshatch look to it. This suit gave Gamera actual chest plates, and his arms didn’t look like they were simply flailing about. The small, upturned plates covering the shell of the Showa Gamera were replaced with large curved plates, and despite the occasional jiggling about, they looked very realistic. He was also given retractable spikes on his elbows as an added melee weapon. Altogether a welcome redesign. 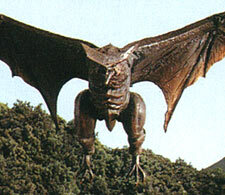 Gyaos looked very sinister. They retained their flat heads, although this time out they were more shovel-shaped than just a V-shape. The eyes were small and white with black pupils, giving them a wild look. Gyaos looked pretty much the same all the way through to her adult form. In her debut movie, Gyaos was noted for having an appetite for humans. In this movie they take the concept a little further, and in a big way. The shots of Gyaos eating, and especially eating people were positively bone chilling. Another nice update to a classic monster. Special effects: This is one area of the movie which I believe places it a notch above many of the greatest monster movies. Kaneko’s team treats the city destruction scenes as if they were an actual occurrence; not just blowing up buildings. Shots of people running through the streets, and the camera and buildings rocking violently with each of the monster’s footsteps really capture the realism of what the viewer thinks would happen if a giant monster showed up in their city. The miniatures are great, and the explosions are on par with the best of them. The special effects in this film are superior to any monster movie I have seen. The positives: Basically everything about this movie is positive. An original and entertaining story, great acting performances, great monster action, and top-notch special effects make this film worthy of even the stingiest monster movie fans’ time. I will go out on a limb here and say that this, along with its two counterparts is three of some of the best monster movies ever made. The negatives: Sorry folks, there isn’t much to say in this department. The only thing I can really think of is the monsters’ portrayal during flight, which was achieved by use of a stiff model, and Gyaos’s flapping wings looked rather unrealistic. But that’s a special effects issue, and hardly takes away from the enjoyment of the movie. The plot at no time felt rushed, and it is a very satisfying watch. I gotta give this one four and a half out of five stars for personal entertainment. If you haven’t seen it yet, you have no idea what you’re missing. Check it out! I’m sure you won’t be disappointed! *Note* Thanks to Kyono Rei for helping me with my review format! Next Post Quick Pic: BATTLE OF THE KINGS!